This chapter offers a theoretical introduction to my central argument, which is followed by three analytical chapters that each concentrate on a particular type of cinematic experience. Here, I explore what is at stake when we decide to look beyond representation and attend to the inbetweens that characterise intermedial cinematic experiences that confront the Holocaust through a review of Alain Resnais’s Night and Fog (Nuit et brouillard 1956). This chapter starts by positioning this approach in contrast to much of the extensive writing about Holocaust representation before moving onto define a philosophy of the inbetween influenced by the work of Didi-Huberman, film phenomenologists, and Deleuze and Guattari. 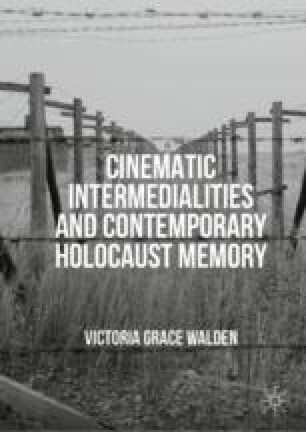 These different and sometimes conflicting methodologies are carefully unpacked in order to consider how they can work together to help identify ways in which intermedial screen works can encourage the production of Holocaust memory. In the final section of the chapter, I then explain how we might think about Holocaust memory as something that can be produced by working through several ideas that have shaped recent developments in memory studies. Nora, P. (2002, April, 19). Reasons for the Current Upsurge in Memory, in Eurozine. http://www.eurozine.com/articles/2002-04-19-nora-en.html. Accessed on 7 October 2015. Wiesel, E. (1989). Art and the Holocaust: Trivalizing Memory. New York Times. http://www.nytimes.com/1989/06/11/movies/art-and-the-holocaust-trivializing-memory.html?pagewanted=all. Accessed 15 January 2012.